For admissions into various engineering institutes across the country, CBSE conducts the JEE (Joint Entrance Exam) every year in both online and offline modes. Many students get confuse while choosing the mode of exam, thinking of the difficulty level of the paper, feasibility of the exam, time duration and several other aspects.Keeping these crucial factors in mind we have compiled a complete report on the JEE Online and JEE Offline exams, which shall help the students understand the advantages and disadvantages of online and offline exam. 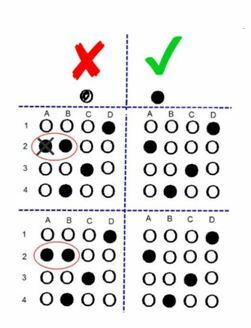 The pen and paper based exam whereby the candidates shall be given the OMR sheets (Optical mark recognition) which consists circles against the options given as answers to the questions. Students need to fill these circles against the correct options which they think to be the right answers to the questions being asked. · Indian students being familiar with the pen and paper mode of exam since very beginning of their education, it is the best mode to choose. · The Pen and Paper modes can be applicable to any city and town of the country where internet can’t be made available for the online mode. · Candidates appearing one of the crucial exam of their life, need not to worry about nay technical glitches that can occur in the online mode. · In certain questions such as diagrammatic questions where measurements are required, it becomes difficult to solve on the computer screens. · A lengthy process of filling the OMR sheets as the students need to solve the problem and then to fill the circles properly, as the circles not filled properly shall be declared disqualified and the marks for that question if ever answered correctly shall not be given to the student. · Not only the answers but also several other areas in the OMR sheet are to be filled carefully, any mishaps can result in the disqualification of the entire exam and that would cost any student a whole year and a lot of mental pressure. · Once marked it is very difficult to change the answer. You need erase the complete circle made and then make another circle filled! This task consumes a lot of time and results in distraction as well. · By looking at the OMR sheet, with a lot of circles and circles all over, it also create a mental outbreak and students most of the time fill the wrong bubble for a particular question. For instance: the answer of Question 85 is say option B, and you filled the circle against question 84 as B. This can create serious problem as the entire chain and the flow breaks. The CBT (Computer Based Test) or the JEE Main Online exam is a computer based exam where every candidate shall be given a computer and has to answer the questions appearing on the screen simply by clicking the tick mark in front of the correct options that the candidates feel for a particular question. There is also a question palette that includes the questions not answered or not attempted which gives you a reminder of the question you might have ignored. · Any questions can be answered at any point of time and there are no worries of marking the circles correctly as in the OMR sheets· Minimum time consumed in marking the right options and most of the time student can focus on the questions and solving them · Official mock test shall be made available by CBSE for all the aspirants to get acquainted with the JEE computer based exam and prepare accordingly. · Mental pressure in the online mode is a bit low as compared to the offline mode due to the crowd and noise created. Where in the CBT, the AC rooms are more peaceful and easy to work at. · The online mode gives the feasibility to the students to choose the date and shift of the exam according to their choices. · Lack of Confidence: Students mostly tend to feel a lack of confidence while appearing the online exam, as reported by many students. They also answer wrongly to the question of which the answers are known to them, just because of the nervousness and lack of confidence. But it is not applicable to every candidates as everyone is not equal with the mind set and level of maturity. · Concentrating on the Computer screen for more than 3 hours is stressful and this can result in copying the wrong figures. · Some students complain of noting wrong figures from the computer to the rough sheets given for solving certain problems basically in physics and mathematics, but it can be the same while answering with the paper based mode. But yes the chances of making such errors in CBT are little high as per the students who appeared the online exam. Is the Level of difficulty in both these modes is different? No, never. It is always the same.There is no difference in the level of difficulty in both these modes. Is the question paper available for the online exam after finishing the exam? Yes, the CBSE shall mail you the questions and the answers of the online exam on the mail ID registered during the filling of the application forms. What are the chances of scoring high in online or offline mode? What shall be the case if the power cut takes place while appearing the online exam? The time is being recorded for the candidates appearing the online exam, in case the power cut takes place there are always the backups available in form of UPS, and the time being consumed in restarting the exam,the time lapse is also being awarded to the candidate and he can resume from the time he/she left the exam. « JEE Toppers of last 15 years: Where are they?